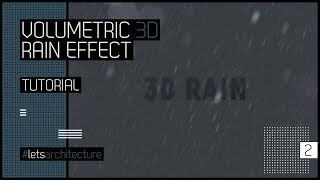 In this short “Let’s Architecture” video tutorial, I will show you how to create a volumetric 3D rain effect using only Photoshop. This is fantastic! So simple yet so effective. Thankyou for sharing. I don’t suppose you’d be able to explain or do a tutorial on how to set up a portfolio in Indesign? Or how to create your own individual look for a portfolio? Cheers. Your videos are awesome and for someone who is starting to get into post production rendering, this is really inspirational. I am looking at getting a new desktop setup and I was wondering what specs your pc runs on? Keep making great videos! !